Every morning, I dress my two-year-old twins in actual children's clothing and comb their hair. And every morning, they take off their pants, hide their socks, and pull out their pony tails. 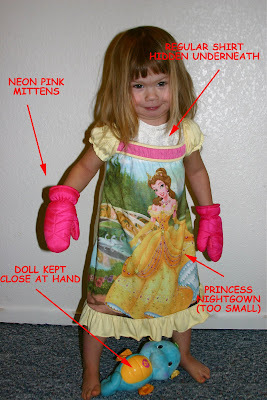 It should not surprise you that my daughters adore mittens, princesses, . . . and strange facial expressions. I just wanna put your girls in my pocket and bring them home! They are so adorable! in our house, it used to be spandex exercise unitards. if I can find a picture, I'll post it. Is THAT what I have to look forward to? Oh brother! Wow, I see a lot of your dad in that expression in second picture. Yeah, but they look so cute!!!!! Even when they're being silly and onry!!! 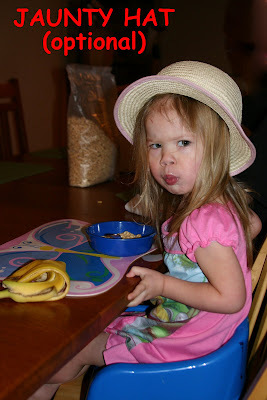 hahahah, you are making me wish i had documented all of the strange outfits my girls used to wear. I kind of miss "Scary Fashion Shows" and "What Not To Wear" days.